At Clyde’s, you’ll never find mixologists behind the bar. Instead, you’ll find hard-working bartenders who’re always happy to help you pick and mix the right poison. And just because you won’t find them chasing down the latest cocktail trends doesn’t mean they don’t know their classics. And the cocktails at Clyde’s are as classic as Clyde’s, itself. Think daiquiris, Margaritas, sidecars and Bloody Marys spiked with a stick of bacon. 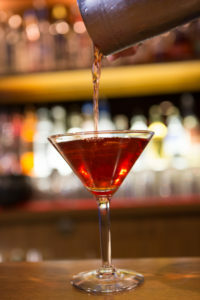 And, of course, there’s always the Manhattan, the elegant and sophisticated go-to cocktail that best pairs with your sweetheart and a night on the dance floor.